Even a shot in the dark can hit its mark. One of the many challenges a game developer faces is how to turn the game he is creating into an attractive experience that will capture the attention, the will to play and even the hearts of the players. That is not an easy task, mind you, as a bad idea or a bad implementation of one element of that idea can impact how well it works and how well it will be received by the public. Mild Beast Games had an idea of making a multiplayer game where all the players are invisible unless under a direct source of light and thus, At Sundown: Shots in the Dark was born. After a lot of work, producing, tweaking, changing and testing it, the game is finally releasing on all major platforms, including the Nintendo Switch, on January 22nd. After playing it for around a week, let me tell you more about my experience with it and how well the game works. Being a game that revolves around the idea of characters only visible under sources of light, At Sundown had a big challenge to find a balance to make each of the arenas fit the theme while also being interesting and beautiful. For the most part, it is fairly easy to say that the developers succeeded in this regard. There are 6 different locations, each with 3 variations and a unique light mechanic such as the floor of the disco lighting up to reveal your location or trains going by and throwing light on its path. This variety creates unique atmospheres and battlegrounds that will add to give this game even more content. Most of them are also very beautifully and easily understandable designed, which will make the experience pleasant to look at and intuitive to move around after some time playing in that arena. However, in a few arenas, whilst under constant action, the At Sundown can sometimes show signs of slowdown or stuttering, but none of them were game breaking and could do with a patch to fix them. I also really like the four character designs, although I never felt that choosing a different character made a lot of difference as all of them play the same, you are almost never seeing them and when you do see, not a lot is really visible. The least favorite and intuitive thing about the visuals are the menu designs. In a few places, such as the result screen, it is obvious that the developers were inspired by Super Smash Bros and are in these situations that the menus work. Apart from it, most of it is made of a white text in a relatively generic font that ends up hurting the game more than helping. Configuring a match is a chore, especially as you add bots and it becomes a list of items to go through without a clear separation between bot and mode configurations. There are also a lot of instances where the game presents you with input options, but only accepts the input after a few seconds, which caused me to choose incorrectly a few times. Musically speaking, the tracks present in it are good enough for accompanying the action present on-screen, but it isn’t as memorable as it should be. So, after a few rounds playing while listening to it, I turned the music off and started listening to other songs. The sound effects represent well the various weapons and other necessaries sounds, but aren’t as essential to the gameplay, just a very neat touch. “How do you control a character well that you normally can’t see?” That was one of the first questions that came to my mind when I first heard about the game and that now I can fully answer: It is a good experience with a few problems, especially, as you start playing the game. Most of your navigation is done through your intuition and calculation based on reference points, such as the last place you were shown in the light. At first or when the action is constant, it can become difficult to track your characters movements, but after a few rounds, it became easier to know where I was as I became more familiar with the mechanic. Although you have to keep track of your position, At Sundown also gives you a few ways to check it. There are the occasional light spots where your character can be seen and you have the ability to press B to reveal your location. Both actions can help you, but also reveals your location to the enemies, which can be a really tricky and strategic tactic that should not be utilized lightly.. The game also uses the vibration of the controller to show that you hit a wall which can help to change direction (Though I wish they did a more specific vibration on Switch to easily identify in which direction you hit the wall). The movement mechanics, combined with a twin-stick shooter style to compose the controls of the game and a part of a few button positions that could have been swapped works well in the heat of combat and will resonate with the player after a few time playing it. 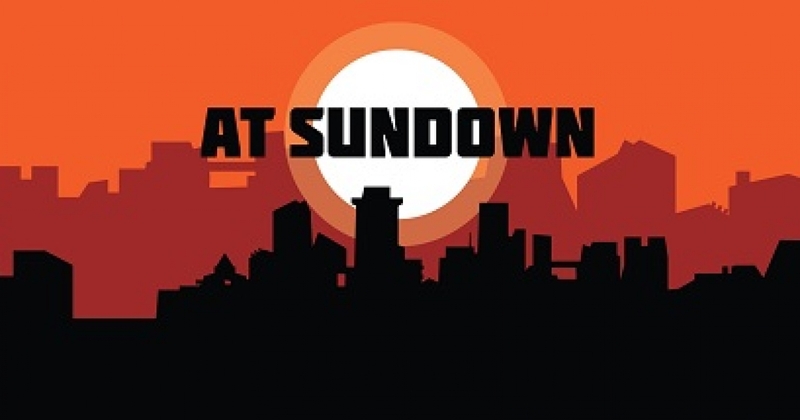 As a multiplayer game, the gameplay should revolve around different weapons and gameplay modes and At sundown delivers that very well. You will have your standard modes, such as King of the Hill and Deathmatch, but also a few creative ones, such as Arms Race, a mode in which you have to get a kill with all the weapons in the game to win. This huge variety gives the players many ways to play in the 18 arenas, making it an amazing party game that can be customizable to the experience you are after, but it is also smart as it doesn’t overwhelm the player with all the content right away. New weapons, arenas and game modes are unlocked as you level up in a constant rhythm allowing the players to get used to them more naturally. Another way to test the weapons is in the training mode that also works as a timed-challenge mode. As you unlock new weapons, more challenges show up, 2 for each weapon and they teach you the specifics of each weapon very well. But unfortunately, this is the only single player content available, but you can always play multiplayer using bots and I can say that they will provide some challenge. Finally, one of the modes this game has is Online, but it wasn’t available during the review period, so post-launch, I will be updating this review, so as to offer my impressions on how the online functions and how it handles itself. At Sundown: Shots in the Dark is a game that has a well thought-out idea that is mostly well executed. If you are looking for a good and fun multiplayer game with a small learning curve, this might be the game you are looking for and that will provide you with many different ways to have fun with your friends locally. However, if you are looking for a single player experience, you will have to get used to playing with bots if you want any fun with it.